The super tough bumper case. 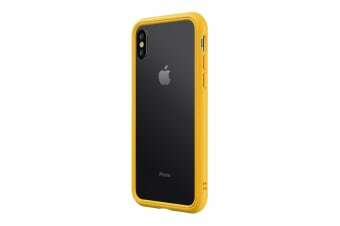 The RhinoShield CrashGuard NX for iPhone XS Max is a bumper case with a difference. This case doesn’t cover up the phone’s back, giving you the choice to enjoy the device’s original design or slap on a skin for a personalised look. The ShockSpread material is super tough, making it incredibly difficult to break. This is because the material is able to resist larger forces. This same property means the case provides a tight fit, preventing your phone from falling out during impact. However, for a strong material, ShockSpread is surprisingly flexible. This means that the case bends slightly for easier installation, without permanent loosening.